Eruna Ichinomiya is preparing to enter high school, but there's just one problem—none of the schools interest her! The uniforms are all too boring, until she discovers Mikagura Academy. After Eruna miraculously passes the entrance exam, she discovers that Mikagura Academy isn't a typical school. Mikagura Academy only allows students to form culture-themed school clubs, participation in those clubs is compulsory, and there is a battle system where students must compete with each other as representatives of their clubs. Now Eruna must discover her own power and win her first battle! Last Note. is a well-known vocaloid artist, who created the popular composition TensionMax. 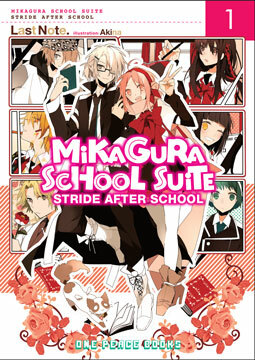 This music was the basis for inspiration behind the light novel series Mikagura School Suite, which has subsequently spawned both a manga and hit animated series. An Interview with Last Note.